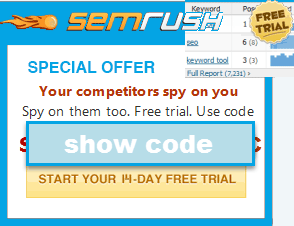 Doorway Pages Ranking in Google in 2011? When Google did the Panda update they highlighted that not only did some "low quality" sites get hammered, but that some "high quality" sites got a boost. Matt Cutts said: "we actually came up with a classifier to say, okay, IRS or Wikipedia or New York Times is over on this side, and the low-quality sites are over on this side." Here is the problem with that sort of classification system: doorway pages. 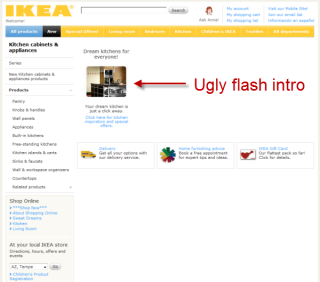 The following Ikea page was ranking page 1 in the search results for a fairly competitive keyword. Once you strip away the site's navigation there are literally only 20 words on that page. And the main body area "content" for that page is a link to a bizarre, confusing, and poor-functioning flash tour which takes a while to load. If you were trying to design the worst possible user experience & wanted to push the "minimum viable product" page into the search results then you really couldn't possibly do much worse that that Ikea page is (at least not without delivering malware and such). I am not accusing Ikea of doing anything spammy. They just have terrible usability on that page. Their backlinks to that page are few in number & look just about as organic as they could possibly come. But not that long ago companies like JC Penny and Overstock were demoted by Google for building targeted deep links (that they needed in order to rank, but were allegedly harming search relevancy & Google user experience). Less than a month later Google arbitrarily changed their algorithm to where other branded sites simply didn't need many (or in some cases any) deep links to get in the game, even if their pages were pure crap. We are told the recent "content farm" update was to demote low quality content. If that is the case, then how does a skeleton of a page like that rank so high? How did that Ikea page go from ranking on the third page of Google's results to the first one? I think Google's classifier is flashing a new set of exploits for those who know what to look for. A basic tip? If you see Google ranking an information-less page like that on a site you own, that might be a green light to see how far you can run with it. Give GoogleBot the "quality content" it seeks. Opportunity abound! This is a perfect example of why it's kind of a joke when Google tells webmasters hurt by the Great Panda Farm update to just improve the "quality" of their content. If Google was actually able to accurately judge the quality of content, they wouldn't need to make sitewide penalties. 1. Be owned by a Fortune 500 Company. 3. Figure out the metrics Google is actually using and change your website to be in accord with those until Google makes their next adjustment to favor large brands. Creating a white list is creating a guaranteed market for certain firms. How can it be more anti-competitive? Spam is the casus belli for killing off a lot of competition in favor of 'brands'. I'm sure all of them invest heavily in Google. Google is a big disappointment. Playing cat and mouse with spammers has a lot more integrity than herd clients for dominant corporations. Cutts is beginning to be almost as bad as Bernake. Hi, I just wanted to commend you on a eye opening article. Well done!